Ok so I am 10 days late writing this post but I have a very good excuse. Or rather an extremely good excuse! No one can not-excuse-me for this excuse. Reuben was admitted to hospital after getting an infection and we lived there for about 5 days. And they have no wi-fi. Life with Reuben is becoming further and further away from the norm. 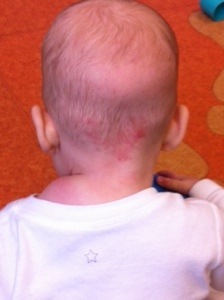 He has had severe eczema his whole life, which I first reported to the doctors when he was 5 weeks old. He sees a pediatrician, dermatologist, dietitian, community nurse and GP regularly. 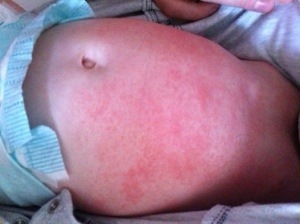 It seems we will also be adding an allergist to that list soon as well as he has now been referred. The Boots Pharmacy staff know us so well that we don’t even have to queue up! It’s all so extremely time consuming, with appointments every week, but all so necessary. 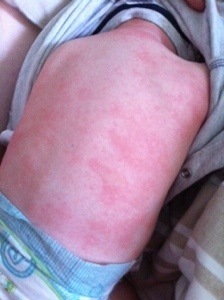 As it stands, Reuben’s eczema is still severe (covering his whole body) and still out of control. Usually eczema can be kept under control using emollient creams and mild hydrocortisone steroids. 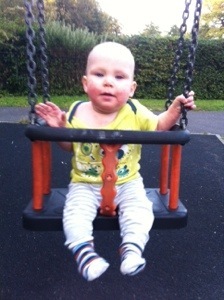 Reuben’s unfortunately doesn’t improve with them and so he has quite strong steroids a lot of the time. They work, but as soon as we stop using them it immediately returns. Long term steroid use is not recommended so we are still experimenting with different treatments to find a solution. Currently we are using Doublebase on his body (although it seems to sting his arms), Aveeno or Aquaphor on his face and Dermol in the bath. 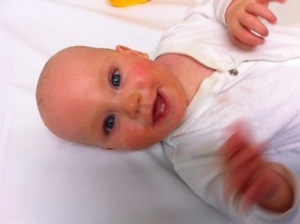 We are using Eumovate steroid on his face and are trialling Protopic (tacrolimus cream) on his body. This cream isn’t even licensed for use in children under 2 years old but Reuben’s dermatologist is hoping it will improve his eczema. The Piriton also isn’t licensed for under 2 years old but it’s the only thing we’ve been given to stop the itch. In addition to this, we have had his blood test results back and it turns out he is allergic to: milk, eggs, all kinds of nuts, fish, wheat, dog hair and cat hair. BUT this list is not exhaustive – this is just what he was tested for! So it is highly likely that we will end up adding things to this list as he reacts to them. 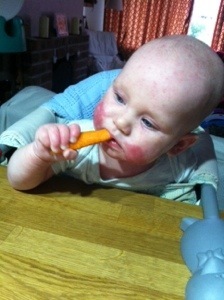 These foods will have made his eczema worse so he is now on a very limited diet. Breastfeeding had to stop (sob!) and he only drinks an amino acid based formula called Neocate. He was actually allergic to the ‘hypoallergenic’ hydrolysed formula. We haven’t yet been able to discuss the results with the paediatrician but his grandparents have a dog and a cat – and we are unsure now what we are supposed to do when we visit. One of the problems with eczema treatments is that they suppress the immune system (eczema is the immune system overreacting) but that means that it cannot fight bacteria so well. Reuben had scratched some deep gouges behind his ears and the doctors think this is how the bacteria that caused his infection entered. It all happened fairly quickly. I went in the shower and he was fine, I came out the shower and he had a giant lump on his neck! So I took him to A&E at 10am and inevitably he got put right at the bottom of the waiting list and was finally seen by a paediatrician at 5.30pm. I hadn’t taken enough milk for him to last that long and so I had an awful time running around the hospital trying to find somewhere I could get milk and food. 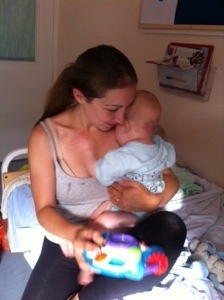 In the end I had to get a doctor to prescribe him some milk (then wait 30 mins at the hospital pharmacy for it!) and gave him some bread and jelly from the cafe as it turns out the hospital is completely void of baby food!! When he was seen at 5.30 the pediatrician apologised profusely – apparently the A&E doctors hadn’t described his lump very well so it hadn’t seemed urgent. She immediately admitted Reuben, taking him up to the children’s ward and inserting a cannula for IV antibiotics. Reuben had been quite happy in himself despite the lump, so it was distressing to see him scream in pain when bloods were taken and the cannula inserted. 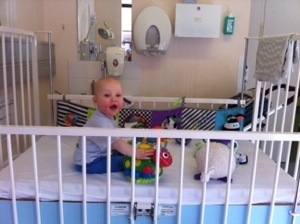 During his hospital stay he had a room to himself (Yay! ), with a bed for me (Yay!) but he wasn’t allowed to leave his room (Boo!). He became extremely clingy and every time I had to leave to go to the toilet or get his bottle ready it was a torment as he would scream until I returned. He slept with me in the bed rather than in his iron-railing cot and he was thoroughly spoilt with lots of snuggles and cuddles and visits from his Grandma and Nanna. 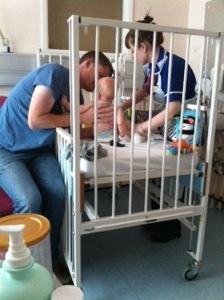 Eventually, with his amazing intelligence (and baby bashing skills) he worked out that he could pull his cannula out! At this point we asked if he could be put on oral antibiotics instead and so after an ultrasound he was allowed to return home. Overall, he has had 1 X-ray, 2 Ultrasounds and 3 Weeks of antibiotics from this hospital visit. 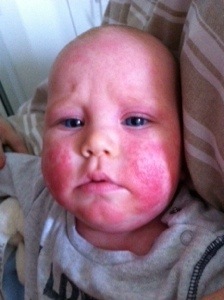 Unfortunately if we don’t get the eczema under control this is likely to happen again. So they are the facts. What’s missing is the heartfelt anguish and absolute emotional exhaustion that has come with these conditions. Reuben is my baby, my tiny (kinda), helpless baby. He can’t talk to let me know if he is feeling itchy, or uncomfortable or in pain. I’m in a position where even though I am trying my best it really isn’t enough to help him. He is facing a lifetime of unbearable itchiness, very strict diets, emotional and physical scarring and many, many doctors appointments. He won’t be able to go swimming without worrying, or go out to eat knowing there will be something he can have. He won’t be able to have a pet dog or cat or even be able to play with home made play dough or finger paints! Right now, he scratches all the time. Distracting him with outings and baby groups works really well but at home it doesn’t. Nights are the worst. He wears Scratch Sleeves and we have to keep socks on him so that he can’t use his toenails to scratch behind his knees. He can’t fall asleep because he is so itchy and he tosses his head back and forth to scrape his cheeks on the bedsheets. He has to be pinned down by us so that he can fall asleep. Every time he stirs in the night he scratches, and that wakes him up. This is only the start though. Somehow, when he is 2 or 3, I will have to stop him from eating the food and cake at his friends birthday parties. When he is 4 and starts school he won’t be able to have cooked lunches. When he is 7 I’ll have to say no to a pet puppy or kitten. When he is 11 he won’t be able to join in with food tech classes and when he is 14 he will be self conscious of his skin. I want to be upbeat, happy and positive about this. After all – things could be a lot worse and I am thankful that despite the endless scratching he is generally a happy boy. But through my trawling of various websites and forums I have found that there is no cure for eczema and that as he has severe eczema he will have many years of suffering ahead. I am so tired, and so stressed out knowing this. I can do nothing to help my baby, my little boy. 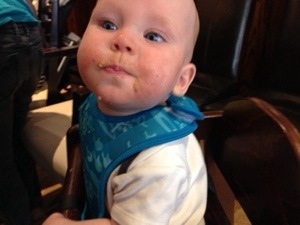 I am hoping that we will find a suitable regime that will keep his eczema under control but I know that this, and his allergies, are here to stay. 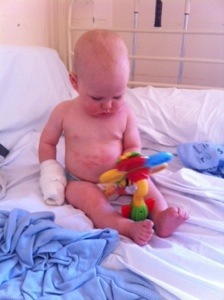 Friends that know we’ve been in hospital keep asking, ‘Is he better now?’ and the answer is no. He isn’t better and will never be better. There’s no cure. There’s no solution. There will be good days. There will be better days when his skin is clear for a while. But no, he will not be ‘better’. This is not a defeatist attitude, it’s just fact. Don’t forget.. you are not alone!! It may also calm down a bit as he gets older; not cured, but just calmed down. Keep smiling, Roo is amazing as are his parents! I feel for you guys. My daughter was full of allergies at around the same age. We had to eliminate practically everything and carried an epipen everywhere. Now, 4 years on, her eczema, asthma and allergies are much better. She goes to school, is able to have lunches there (yay!) and is a great kid. What has changed is our attitude too. We know one day, she will come across a peanut somewhere and eat it by accident (or nut oil) and we will deal with it. We have decided not to live I’m fear though, and it doesn’t stop us doing many things these days.